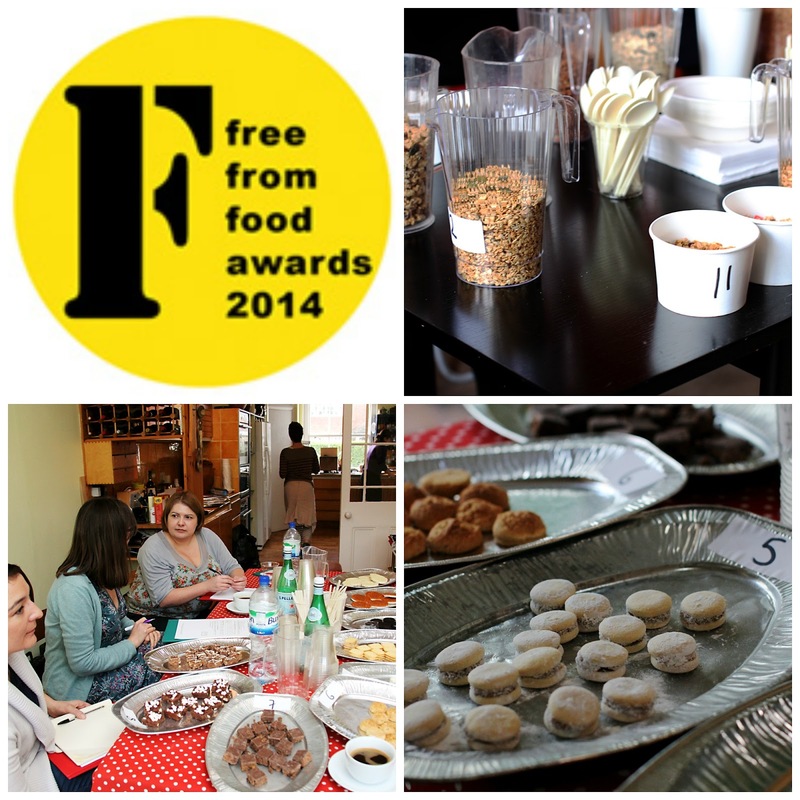 2014 is the seventh annual Free From Food Awards. The bright yellow award logos are now seen on a range of freefrom products from one man/woman producers of freefrom cupcakes to supermarket own label ranges. Freefrom food is the only food sector to have shown steady 15% year on year growth over the last 5 years. New categories for this year’s awards include ‘Breakfast’ (cereals, baked goods, animal and animal free yogurts and milks), ‘Food to go’, ‘After Dinner Foods’ (desserts, chocolates and petit fours, animal free ‘cheeses’ and cheese biscuits), Pasta and Pizza and Low sulphite wines. ‘Returning’ categories include breads, cakes, store cupboard, ready meals, ‘raw’ foods, children’s food and the ever popular gluten-free beer category. Taking part in judging is certainly an eye opener and a slightly different experience to the sister awards for skincare. I thought I had a wide knowledge of free from food products on the market but there are many brands that I have yet to discover so I wonder, where are they all hiding? I took part in two categories, Breakfast and scones, sweet tarts, sweet biscuits and cookies. Obviously, I did not take part in tasting animal milk products but surprisingly I had to skip biscuits/cookies. The latter appears to me to be purely targeted at the gluten free market and barely catering for other allergies. Out of the gluten free products entered into this category (I think it was 17 or 18) only two did not contained milk and/or egg. It frustrates me a great deal. Manufacturers seem to be forgetting that it is quite common to have more than one allergy/intolerance. I know demanding more free from biscuits is controversial given the recent press over sugar but there are occasions where I think most people would like a biscuit to dunk in a cup of tea. If you are making dairy free and egg free biscuits and cakes then a) Why are you not shouting about it? b) Why are you not entering the Free From Awards? People like me need you! We want to celebrate the fact that you recognise multiple allergies. Oh and if someone could make me egg and dairy free, vegetarian rocky road, you would have a customer for life! Despite this little hiccup, I do not wish to distract attention from the awards because they help raise the profile of free from foods for consumers and the industry. I enjoyed my day of judging and it is really interesting to be in a room full of people who understand free from living. It was also nice to meet people I tweet with - Mel @Piginthekitchen, Alexa @foodallergyuk & Julia @AlimentaryBites. The shortlisted products will be announced on 12th February. Follow @FFFoodAwards on Twitter as I am sure they will be tweeting about it. That must have been a very frustrating category for you to judge. I was lucky only a few of the products in the after dinner foods contained dairy. I did wonder why they decided to include dairy when alternatives can be easily found and in most cases cheaply used. I knew it would not be great given my experience at supermarkets but I thought I might discover some new brands. Egg is the big sticking point for me drives me crazy. Also the GF version of a Bourbon biscuit contains dairy but regular versions are dairy free!